Federal prosecutors are threatening elected officials in states considering regulating medical marijuana dispensaries. It's working, so far. The Montana legislature has passed a medical marijuana reform bill that is "repeal in disguise," according to advocates. The governor is also unhappy with it. He has ten days to veto it, but says he will let it become law. There are no dispensaries or patient and provider registries left in the Washington medical marijuana dispensary and patient and provider registry bill after Gov. Gregoire took her veto pen to it. Ohio insurance magnate Peter Lewis has given millions for drug reform efforts across the country. Now, he'd like to see medical marijuana come to his home state. 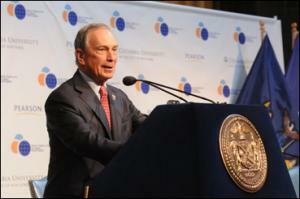 New York City Mayor Michael Bloomberg started to talk sense about drug legalization, but quickly fumbled. Meanwhile his police officers are arresting thousands of marijuana users -- in a city that has decriminalization! A sweeping review of New Zealand's drug laws is calling for steps toward medical marijuana, decriminalization of drug possession and small-time dealing, and doing away with drug paraphernalia laws. Not too bad. Wisconsin marijuana activist, First Amendment supporter, and gadfly to the establishment Ben Masel has died of lung cancer at age 56. April was the deadliest month so far in Mexico's prohibition-related violence, with authorities reporting 1,402 killings. Perverted probation officers, greedy jail guards, and a perjury plot backfires. Was it an attempted rip-off of prospective dope and gun buyers? Hard to say, but one man is dead after undercover narcs and the people they were there to bust got into a gunfight.